The Three Graces tapestry shows the famous work of the Italian master Botticelli with the three graces. Part of the work of the work "Le Printemps de Botticelli" these 3 graces represents the goddesses of charm, beauty, and human creativity. They were symbolised by three women, from youngest to oldest, Aglaea, Euphrosyne and Thalia. The three graces in Sandro Botticelli's work are holding hands and are together in a garden near the goddess Venus, protected by several gods and goddesses including the three virtues, who were thought to be the daughters of Zeus and Eurynome, or Dionysus and Aphrodite. Their clear and almost see through garments, Botticelli's choice of orange hair and the setting with a plethora of other goddesses and prominent figures in this garden makes his work unique among the other depictions of the three graces such as the one by Rapheal which showed them in isolation. 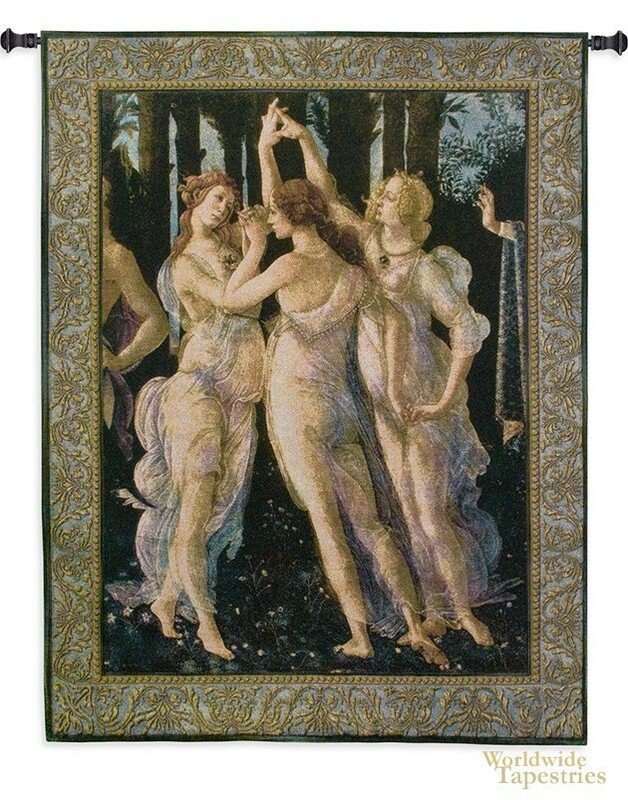 The Three Graces tapestry is backed with a lining and a tunnel for easy hanging. Note: tapestry rod and tassels, where pictured, are not included in the price. Dimensions: W 41" x H 53"